For the journal, see Oncogene (journal). Apoptosis is a form of programmed cell death that occurs in multicellular organisms. Biochemical events lead to characteristic cell changes (morphology) and death. These changes include blebbing, cell shrinkage, nuclear fragmentation, chromatin condensation, chromosomal DNA fragmentation, and global mRNA decay. The average adult human loses between 50 and 70 billion cells each day due to apoptosis. For an average human child between the ages of 8 to 14 year old approximately 20 to 30 billion cells die per day. The theory of oncogenes was foreshadowed by the German biologist Theodor Boveri in his 1914 book Zur Frage der Entstehung Maligner Tumoren ('The Origin of Malignant Tumours'), Gustav Fisher, Jena, 1914. Oncogenes (Teilungsfoerdernde Chromosomen) that become amplified (im permanenten Übergewicht) during tumour development. A retrovirus is a type of RNA virus that inserts a copy of its genome into the DNA of a host cell that it invades, thus changing the genome of that cell. Such viruses are specifically classified as single-stranded positive-sense RNA viruses. A nucleic acid sequence is a succession of letters that indicate the order of nucleotides forming alleles within a DNA or RNA (GACU) molecule. By convention, sequences are usually presented from the 5' end to the 3' end. For DNA, the sense strand is used. Because nucleic acids are normally linear (unbranched) polymers, specifying the sequence is equivalent to defining the covalent structure of the entire molecule. For this reason, the nucleic acid sequence is also termed the primary structure. John Michael Bishop is an American immunologist and microbiologist who shared the 1989 Nobel Prize in Physiology or Medicine with Harold E. Varmus and was co-winner of 1984 Alfred P. Sloan Prize. He serves as an active faculty member at the University of California, San Francisco (UCSF), where he also served as Chancellor from 1998 to 2009. Harold Eliot Varmus is an American Nobel Prize-winning scientist who was director of the National Institutes of Health from 1993 to 1999 and the 14th Director of the National Cancer Institute from 2010 to 2015, a post to which he was appointed by President Barack Obama. He was a co-recipient of the 1989 Nobel Prize in Physiology or Medicine for discovery of the cellular origin of retroviral oncogenes. He is currently the Lewis Thomas University Professor of Medicine at Weill Cornell Medicine and a Senior Associate at the New York Genome Center. 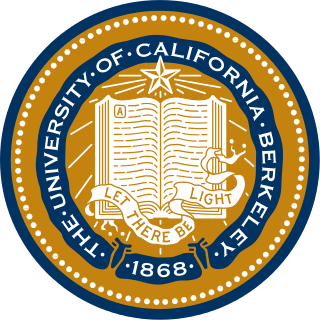 The University of California, San Francisco (UCSF) is a public research university in San Francisco, California. 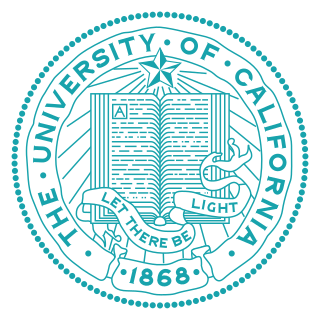 It is part of the University of California system and it is dedicated entirely to health science. It is a major center of medical and biological research and teaching. The resultant protein encoded by an oncogene is termed oncoprotein. Oncogenes play an important role in the regulation or synthesis of proteins linked to tumorigenic cell growth. Some oncoproteins are accepted and used as tumor markers. The Spanish biochemist Mariano Barbacid isolated the first oncogene. His discovery was published in the prestigious journal Nature in 1982 in an article titled "A point mutation is responsible for the acquisition of transforming properties by the T24 human bladder-carcinoma oncogene". He spent the following months extending his research, eventually discovering that such oncogene was the mutation of an allele of the Ras subfamily, as well as its activation mechanism. Mariano Barbacid is a Spanish molecular biochemist who discovered the first oncogene. His discovery was published in the prestigious journal Nature in 1982 in an article titled "A point mutation is responsible for the acquisition of transforming properties by the T24 human bladder-carcinoma oncogene". He spent the following months extending his research, eventually discovering that such oncogene was the mutation of an allele of the Ras subfamily, as well as its activation mechanism. An allele is a variant form of a given gene. Sometimes, the presence of different alleles of the same gene can result in different observable phenotypic traits, such as different pigmentation. A notable example of this trait of color variation is Gregor Mendel's discovery that the white and purple flower colors in pea plants were the result of "pure line" traits which could be used as a control for future experiments. However, most genetic variations result in little or no observable variation. Ras is a family of related proteins which is expressed in all animal cell lineages and organs. All Ras protein family members belong to a class of protein called small GTPase, and are involved in transmitting signals within cells. 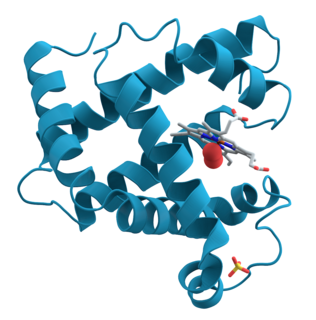 Ras is the prototypical member of the Ras superfamily of proteins, which are all related in 3D structure and regulate diverse cell behaviours. The expression of oncogenes can be regulated by microRNAs (miRNAs), small RNAs 21-25 nucleotides in length that control gene expression by downregulating them. Mutations in such microRNAs (known as oncomirs) can lead to activation of oncogenes. Antisense messenger RNAs could theoretically be used to block the effects of oncogenes. Growth factors, or mitogens c-Sis glioblastomas, fibrosarcomas, osteosarcomas, breast carcinomas, and melanomas  induces cell proliferation. Receptor tyrosine kinases epidermal growth factor receptor (EGFR), platelet-derived growth factor receptor (PDGFR), and vascular endothelial growth factor receptor (VEGFR), HER2/neu Breast cancer, gastrointestinal stromal tumours, non-small-cell lung cancer and pancreatic cancer  transduce signals for cell growth and differentiation. Transcription factors myc gene malignant T-cell lymphomas and acute myleoid leukemias, breast cancer, pancreatic cancer, retinoblastoma, and small cell lung cancer  -They regulate transcription of genes that induce cell proliferation. Growth factors are usually secreted by either specialized or non-specialized cells to induce cell proliferation in themselves, nearby cells, or distant cells. An oncogene may cause a cell to secrete growth factors even though it does not normally do so. It will thereby induce its own uncontrolled proliferation ( autocrine loop ), and proliferation of neighboring cells, possibly leading to tumor formation. It may also cause production of growth hormones in other parts of the body. Receptor tyrosine kinases add phosphate groups to other proteins in order to turn them on or off. Receptor kinases add phosphate groups to receptor proteins at the surface of the cell (which receives protein signals from outside the cell and transmits them to the inside of the cell). Tyrosine kinases add phosphate groups to the amino acid tyrosine in the target protein. They can cause cancer by turning the receptor permanently on (constitutively), even without signals from outside the cell. The Philadelphia chromosome or Philadelphia translocation (Ph) is a specific genetic abnormality in chromosome 22 of leukemia cancer cells. 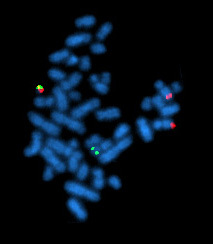 This chromosome is defective and unusually short because of reciprocal translocation, t(9;22)(q34;q11), of genetic material between chromosome 9 and chromosome 22, and contains a fusion gene called BCR-ABL1. This gene is the ABL1 gene of chromosome 9 juxtaposed onto the breakpoint cluster region BCR gene of chromosome 22, coding for a hybrid protein: a tyrosine kinase signalling protein that is "always on", causing the cell to divide uncontrollably by interrupting the stability of the genome and impairing various signaling pathways governing the cell cycle. Abelson murine leukemia viral oncogene homolog 1 also known as ABL1 is a protein that, in humans, is encoded by the ABL1 gene located on chromosome 9. c-Abl is sometimes used to refer to the version of the gene found within the mammalian genome, while v-Abl refers to the viral gene. The MAPK/ERK pathway is a chain of proteins in the cell that communicates a signal from a receptor on the surface of the cell to the DNA in the nucleus of the cell. Myc is a family of regulator genes and proto-oncogenes that code for transcription factors. The Myc family consists of three related human genes: c-myc, l-myc, and n-myc. c-myc was the first gene to be discovered in this family, due to homology with the viral gene v-myc. 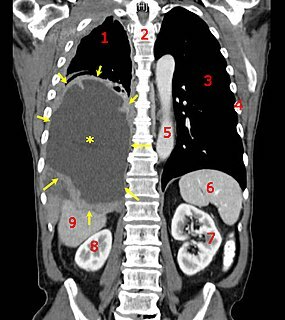 The breakpoint cluster region protein (BCR) also known as renal carcinoma antigen NY-REN-26 is a protein that in humans is encoded by the BCR gene. BCR is one of the two genes in the BCR-ABL complex, which is associated with the Philadelphia chromosome. Two transcript variants encoding different isoforms have been found for this gene. v-Src is a gene found in Rous sarcoma virus that encodes a tyrosine kinase that causes a type of cancer in chickens. Acute myeloblastic leukemia with maturation (M2) is a subtype of acute myeloid leukemia (AML). ETV6 protein is a transcription factor that in humans is encoded by the ETV6 gene. The ETV6 protein regulates the development and growth of diverse cell types, particularly those of hematological tissues. However, its gene, ETV6 frequently suffers various mutations that lead to an array of potentially lethal cancers, i.e., ETV6 is a clinically significant proto-oncogene in that it can fuse with other genes to drive the development and/or progression of certain cancers. However, ETV6 is also an anti-oncogene or tumor suppressor gene in that mutations in it that encode for a truncated and therefore inactive protein are also associated with certain types of cancers. Tyrosine-protein kinase Fes/Fps also known as proto-oncogene c-Fes/Fps is an enzyme that in humans is encoded by the FES gene. FES was originally cloned as a retroviral oncogene from feline (v-FES) and avian (v-FPS) sarcomas. This triggered the subsequent identification and cloning of the cellular FES (c-FES) genes in birds and mammals. 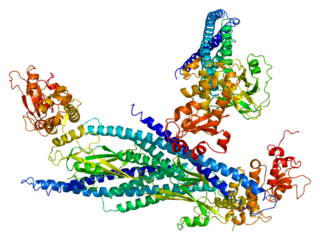 Macrophage-stimulating protein receptor is a protein that in humans is encoded by the MST1R gene. MST1R is also known as RON kinase, named after the French city in which it was discovered. It is related to the c-MET receptor tyrosine kinase. Antineoplastic resistance, often used interchangeably with chemotherapy resistance, is the resistance of neoplastic (cancerous) cells, or the ability of cancer cells to survive and grow despite anti-cancer therapies. In some cases, cancers can evolve resistance to multiple drugs, called multiple drug resistance. Clonal hypereosinophilia, also termed primary hypereosinophilia or clonal eosinophilia, is a grouping of hematological disorders all of which are characterized by the development and growth of a pre-malignant or malignant population of eosinophils, a type of white blood cell that occupies the bone marrow, blood, and other tissues. This population consists of a clone of eosinophils, i.e. a group of genetically identical eosinophils derived from a sufficiently mutated ancestor cell. ↑ Wilbur B, ed. (2009). The World of the Cell (7th ed.). San Francisco, C.
↑ Croce CM (January 2008). "Oncogenes and cancer". The New England Journal of Medicine. 358 (5): 502–11. doi:10.1056/NEJMra072367. PMID 18234754. ↑ Yokota J (March 2000). "Tumor progression and metastasis" (PDF). Carcinogenesis. 21 (3): 497–503. doi:10.1093/carcin/21.3.497. PMID 10688870. ↑ (A.P. Czernilofsky et al., 1980, Nature Vol 287, pp 198-203). ↑ Chapter 20 - NEOPLASMS OF THE THYROID - in: Mitchell, Richard Sheppard; Kumar, Vinay; Abbas, Abul K.; Fausto, Nelson (2007). Robbins Basic Pathology. Philadelphia: Saunders. ISBN 978-1-4160-2973-1. 8th edition. ↑ Reddy EP, Reynolds RK, Santos E, Barbacid M. «A point mutation is responsible for the acquisition of transforming properties by the T24 human bladder carcinoma oncogene.» Nature 1982 Nov 11; 300 (5888): 149–52. ↑ Todd R, Wong DT (1999). "Oncogenes". Anticancer Research. 19 (6A): 4729–46. PMID 10697588. ↑ Chial, H (2008). "Proto-oncogenes to Oncogenes to Cancer". Nature Education. 1 (1). ↑ Negrini M, Ferracin M, Sabbioni S, Croce CM (June 2007). "MicroRNAs in human cancer: from research to therapy". Journal of Cell Science. 120 (Pt 11): 1833–40. doi:10.1242/jcs.03450. PMID 17515481. ↑ Esquela-Kerscher A, Slack FJ (April 2006). "Oncomirs - microRNAs with a role in cancer". Nature Reviews. Cancer. 6 (4): 259–69. doi:10.1038/nrc1840. PMID 16557279. ↑ Press, Richard; Anita Misra; Glenda Gillaspy; David Samols; David A. Goldthwait (June 1, 1989). "Control of the Expression of c-sis mRNA in Human Glioblastoma Cells by Phorbol Ester and Transforming Growth Factor ß1". Cancer Research (49): 2914–2920. ↑ Gschwind A, Fischer OM, Ullrich A (May 2004). "The discovery of receptor tyrosine kinases: targets for cancer therapy". Nature Reviews. Cancer. 4 (5): 361–70. doi:10.1038/nrc1360. PMID 15122207. ↑ Summy JM, Gallick GE (December 2003). "Src family kinases in tumor progression and metastasis". Cancer Metastasis Reviews. 22 (4): 337–58. doi:10.1023/A:1023772912750. PMID 12884910. ↑ Thomas SM, Brugge JS (1 November 1997). "Cellular functions regulated by Src family kinases". Annual Review of Cell and Developmental Biology. 13 (1): 513–609. doi:10.1146/annurev.cellbio.13.1.513. PMID 9442882. ↑ Garnett MJ, Marais R (October 2004). "Guilty as charged: B-RAF is a human oncogene". Cancer Cell. 6 (4): 313–9. doi:10.1016/j.ccr.2004.09.022. PMID 15488754. ↑ Leicht DT, Balan V, Kaplun A, Singh-Gupta V, Kaplun L, Dobson M, Tzivion G (August 2007). "Raf kinases: function, regulation and role in human cancer". Biochimica et Biophysica Acta. 1773 (8): 1196–212. doi:10.1016/j.bbamcr.2007.05.001. PMC 1986673 . PMID 17555829. ↑ Bos JL (September 1989). "ras oncogenes in human cancer: a review". Cancer Research. 49 (17): 4682–9. PMID 2547513. ↑ Hilgenfeld R (December 1995). "Regulatory GTPases". Current Opinion in Structural Biology. 5 (6): 810–7. doi:10.1016/0959-440X(95)80015-8. PMID 8749370. ↑ Felsher DW, Bishop JM (August 1999). "Reversible tumorigenesis by MYC in hematopoietic lineages". Molecular Cell. 4 (2): 199–207. doi:10.1016/S1097-2765(00)80367-6. PMID 10488335. ↑ Cargnello, M.; Roux, P. P. (2011). "Activation and Function of the MAPKs and Their Substrates, the MAPK-Activated Protein Kinases". Microbiology and Molecular Biology Reviews. 75 (1): 50–83. doi:10.1128/MMBR.00031-10. PMC 3063353 . PMID 21372320.